Appointments to see Prof David Fulcher can be made by referral, via your specialist or general practitioner. Ideally the referral letter should be sent before the appointment. This may be done by sending us a photo of it by SMS, fax or mail. Make sure to include your contact details, email address, and medicare number and the Practice Manager will contact you to make an appointment time. Please refer to the Contact page for further details. Prof Fulcher's main consulating rooms is in Norwest Business Park in Baulkham Hills (see "Find us"). 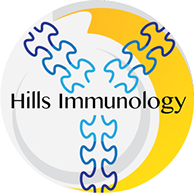 He sees patients with immunological diseases of the mouth at Sydney Oral Immunology, a combined clinic with Dr Sue-Ching Yeoh, at 518 Windsor Rd, Baulkham Hills. 2153. He also consults in Canberra, once a fortnight, at National Capital Medical Specialists.